Sculpture in Stone (MFA), no. 135; Sculpture in Stone and Bronze (MFA), p. 110 (additional published references). Head and neck were probably worked for insertion; the bottom surface slopes downward from back to front. It is also possible, however, that the work was intended to be an independent bust. 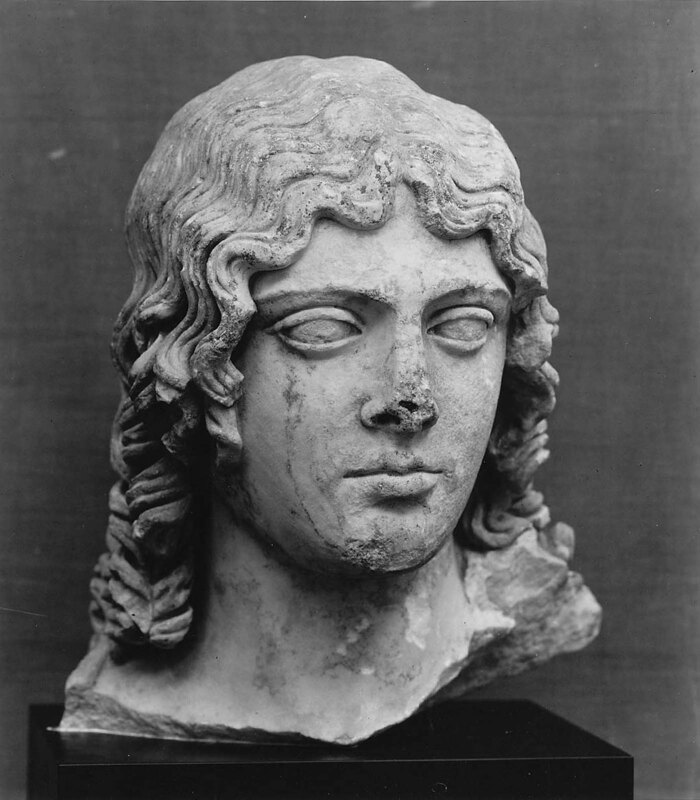 The base of the neck is broken along the front and left side; the tip of the nose and the ends of some of the curls are missing. The eyes and the chin have been slightly injured, and the surface of the left side of the face and the upper lip is corroded. 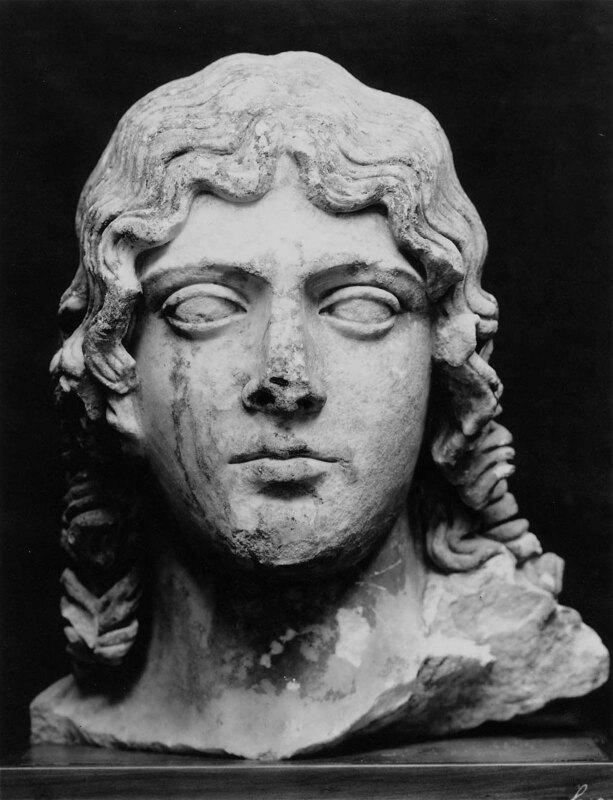 This head belonged to a standing figure of a goddess of heroic size, heavily draped in chiton and himation. 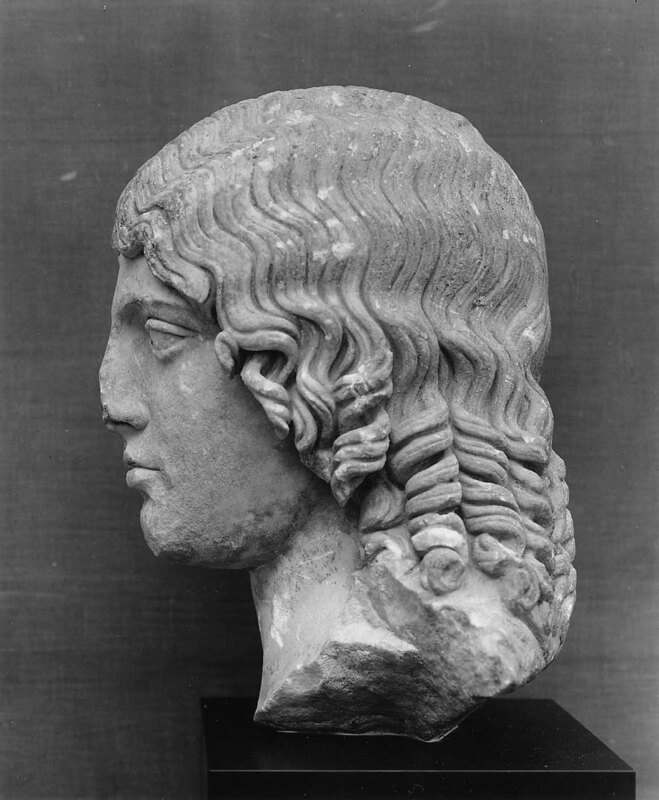 The figure stood with the head turned slightly to the left, the treatment of the hair showing the original to have been of bronze. Thick, wavy tresses are carried from a central parting to the sides of the head. They come down low on the forehead and terminate in spiral curls which frame the face and extend as far as the shoulders. The eyebrows are rendered as sharp lines, continuing down the bridge of the nose. The closed mouth, slightly depressed at the corners and with prominent under-lip, enhances the severity of expression, brought out also by the heavy chin. The hair loose on the goddess’ shoulders probably indicates that she is Demeter mourning for her abducted daughter Kore/Persephone. Harvard Lab No. HI726: Isotope ratios - delta13C +4.96 / delta18O -2.67, Attribution - Paros 1, Justification - Fine to medium grained marble with glassy reflections.